Is this a stunning display or what? The private collection of Joanna S. Rose. Staged by The American Folk Art Museum. For more images, a wonderful slideshow and article click here. 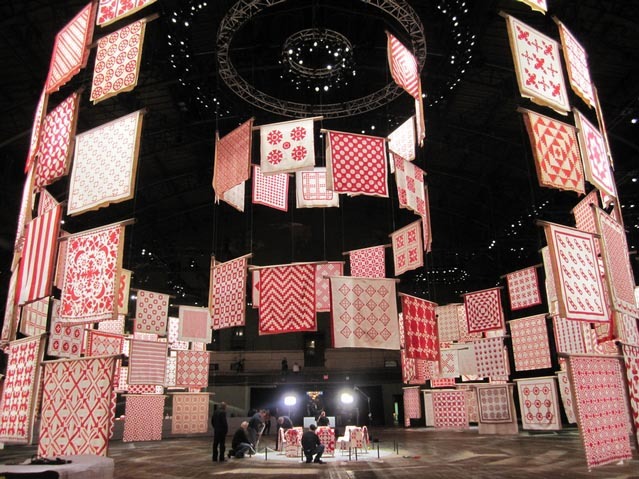 we're all excited about this in the quilt world and it's great to see "quilting" getting it's due respect in the art world. another perspective and slide show here. 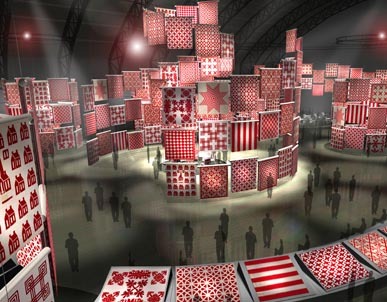 I cannot believe I missed the show - hundreds of red and white quilts - how interesting could that be, right??? Wrong - what a spectacle of beauty - my loss! I took the train from Boston to NYC on Saturday just to see the show. It was AMAZING! I have a red/white quilt on my own wall! That is a beautiful display! This reminds me of the scene in Fantasia where Mickey mouse makes everything dance around him -- so beautiful! First, what an incredible display of art. Second - the incredible sewing. Who said sewing is not an art-form? These quilts prove that quilting is an art and must be handed down to the generations or it will become mechanical and never sown by hand. We cannot allow that to happen. If you have tons of money this stuff will work on reality there's no doubt about this!